In 1946, Willys-Overland introduced the first all-steel station wagon and sedan delivery vehicles. These two-wheel-drive vehicles featured seven-passenger capacity and reached a top speed of 65 mph. When four-wheel drive and a Willys six-cylinder engine were added in 1949, the Jeep All-Steel Station Wagon truly became the forerunner of the modern-day Jeep Cherokee. The CJ Model was updated in 1953, becoming the CJ-3B. It was the first Jeep CJ with noticeable body changes from its military predecessor. It had a taller body grille and hood to accommodate the new Hurricane F-Head four-cylinder engine. Willys-Overland was sold to the Henry J. Kaiser interests for $60 million in 1953. Kaiser truly made the Jeep CJ vehicle an international symbol. In the 16 years of Kaiser, ownership manufacturing facilities were established in some 30 foreign countries, and Jeep vehicles were marketed in more than 150 countries around the world. The Wagoneer, powered by the first modern mass-produced overhead-cam six-cylinder truck engine known as the “Tornado-OHC” six, could also be had with an industry first automatic transmission on a four-wheel-drive vehicle and independent front suspension. It was offered in two and four-wheel-drive versions. In 1965, a new “Dauntless” V-6 engine was introduced as an option on both the 81-inch wheelbase CJ-5 and 101-inch wheelbase CJ-6. The 155-horsepower engine almost doubled the horsepower of the standard Hurricane four-cylinder engine. It was the first time a Jeep CJ could be equipped with a V6. As production of Jeep vehicles increased threefold during the 1970s, AMC made many improvements to Jeep vehicles including a choice of four, six or eight-cylinder engines. In 1970, after two decades, Kaiser Jeep was bought by American Motors Corporation. Their first move was to split civilian and military vehicle production as 4WD vehicles became more popular than ever in the civilian market. By 1978, total Jeep vehicle production was up to 600 vehicles a day, over three times what it had been at the start of the decade. However, while the growing market for compact 4WD vehicles still sought the utilitarian virtues of the Jeep CJ series, consumers also were seeking more of the “creature features” associated with the typical passenger car. 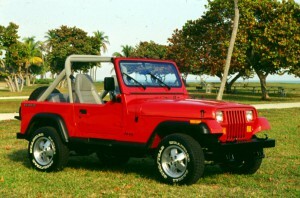 AMC responded to this market demand in 1986 by discontinuing the CJ series and by introducing the 1987 Jeep Wrangler (YJ). On August 5, 1987, American Motors Corporation was sold to the Chrysler Corporation and the popular Jeep brand became a part of the Jeep/Eagle Division of Chrysler Corporation. Research had found that future markets lay in compact sport-utility vehicles. AMC then pumped $250 million into the design and production of the new compact 1984 (XJ) Cherokee and Wagoneer sports wagons. Several four-wheel drive systems, including Command-Trac® and Selec-Trac®, offered either part-time or full-time four-wheel traction. Various interior and exterior styling, comfort and off-road performance packages were also offered. The ’90s saw the introduction of the highly popular and award winning Jeep Grand Cherokee. 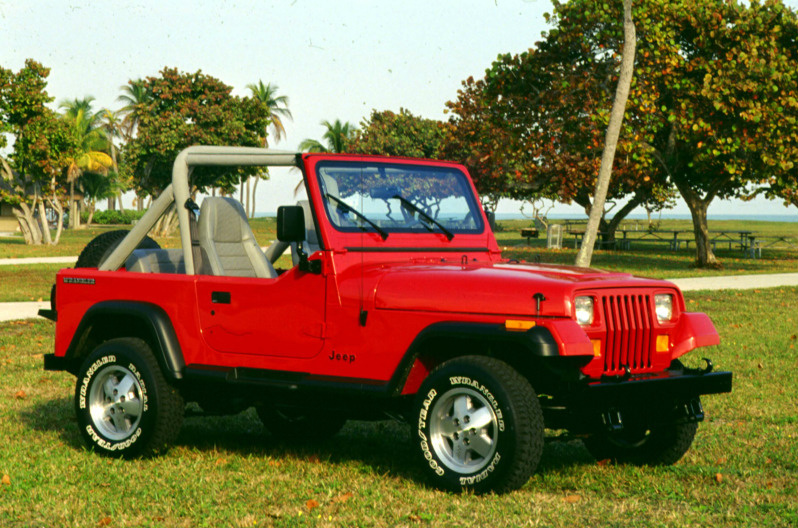 And the Wrangler and the Cherokee were redesigned and refined for 1997 model year. The ’90s saw Jeep engineers develop a right-hand-drive version of the Cherokee to export to markets in Britain, Australia and Japan. Jeep engineers had one more model to add: the Grand Wagoneer Limited. It was introduced as the ultimate luxury performance model, powered by an electronically fuel-injected 5.9-litre V8 engine. But with the introduction of the 1993 Grand Cherokee, the Grand Wagoneer Limited was discontinued.